The prices of the products are expressed in Euros, VAT included. Lyra srl, reserves the right to change prices at any time, as a result of market changes or typographical errors. Clearly for every purchase made, apply, in each case, the prices in force at the time of the order. 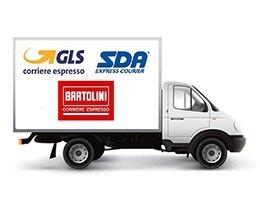 The goods are delivered with an invoice, where required, alternatively, will be made a tax receipt. The total warranty of the customer, through the conditions “Satisfied or Reimbursed”, also known as the right of withdrawal, and "Free Replacement".Any complaints must be received within 14 days from receipt of merchandise, directly to our office via fax or e-mail; we do not accept claims of quality, if not met the standards of the washing instructions on the labels.Before send goods, make sure that it is in the same condition in which it arrived, and keep all labels and tags attached. The costs of delivery are the responsibility of the customer. The goods once reached our warehouse, will be examined to assess any damages or tampering not caused by transport. After having checked the integrity of the goods, we will reimburse the amount already paid by bank transfer to the account you sent to our customer service. The refund relates to the price of the product and the first transport costs incurred, if incurred. The refund will be made no later than 14 days from the time when we will return the goods for which you want to exercise the right of withdrawal. The only expenses charged to the customer are those relating to the return of the product. Shipping costs are charged in case of orders below € 250.00 (VAT excluded).Shipments are made by courier. 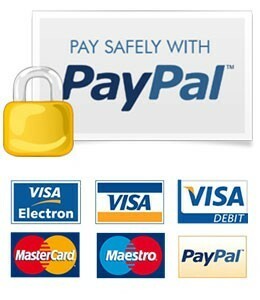 Payment can be made by cash, bank transfer, credit card on a circuit protected by Paypal. For more information refer to the Transport page and Payment.Any exceptional change to the order will be accepted not later than 24 hours from the date of receipt of the same. Lyra srl guarantees that the e-mail addresses provided by customers will never be sold to third parties for commercial purposes. More in general, are applied to the privacy information pursuant to art. 13 of the D. Lgs. no.196/2003. For more information, consult the Privacy page. Normally orders are delivered within 2 or 3 working days. In some cases, delivery may occur with a few days of delay up to a maximum of 5 working days from order. If you expect a delivery the next 5 days, you will be promptly notified. In any case of force majeure or fortuitous event, The Lyra srl cannot be held responsible for the delay or non-delivery and reserves the right to terminate all or part of the contract, suspend or postpone the execution. The terms and conditions of sale may be modified at any time, without notice. For every purchase worth, however, the conditions in force at the time of the order, read and accepted by the customer before confirming the order the same. Lyra srl undertakes to observe the applicable normative on distance sale. For any dispute the competent court is the court of Lucca.